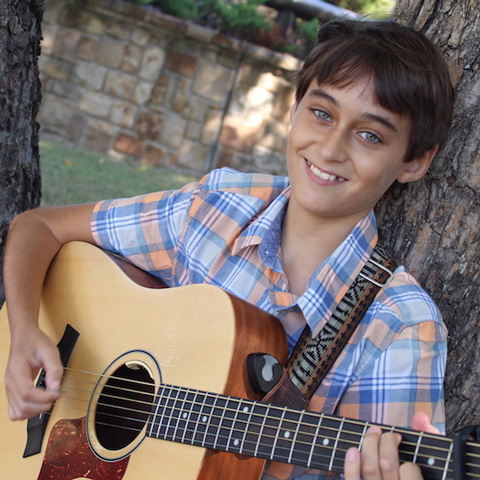 Andrew Goldstein is a singer/songwriter from McKinney, TX. He started beatboxing at age 7, started learning guitar at age 9. Andrew wrote his first song at age 10, a setting for Mi Chamocha, which he debuted at his first Songleader Boot Camp in 2015. He has performed several of his originals at Camp Hess Kramer in Malibu, CA and at his synagogue, Adat Chaverim in Plano, TX. Andrew also dabbles in percussion and piano. Andrew’s first “rock” concert was a Rick Recht concert and he was quickly bitten by the Jewish Rock bug. He has since then become a prolific song writer, often writing songs in the Jewish context. He has been blessed to study under Rick Recht, Mikey Pauker and Joe Buchanan and his dream is to become a Jewish Rock Star! When he is not writing new music, Andrew attends Imagine International Academy of North Texas, an International Baccalaureate school in McKinney where is a member of the jazz band. Andrew can also be seen leading services once a month at Adat Chaverim or accompanying his dad, Jonathan Goldstein, who is the Religious School Music Director and Cantorial Soloist. Andrew hopes to study music in college and become a Jewish rock star…one day!